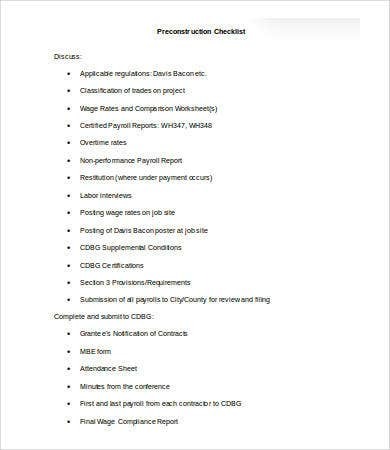 A construction checklist is a guide of the items that you need to have for construction or a list of procedures and processes that you need to do to finish the construction of a certain infrastructure. 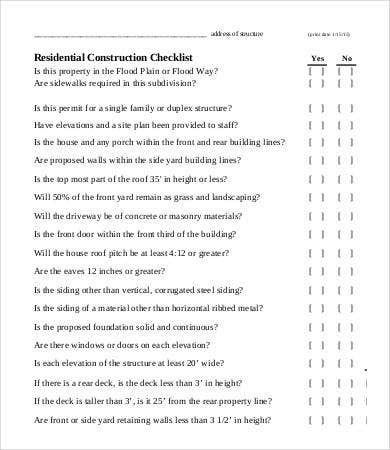 A construction checklist may be used in different constructions from the creation of big building up to building a small home. 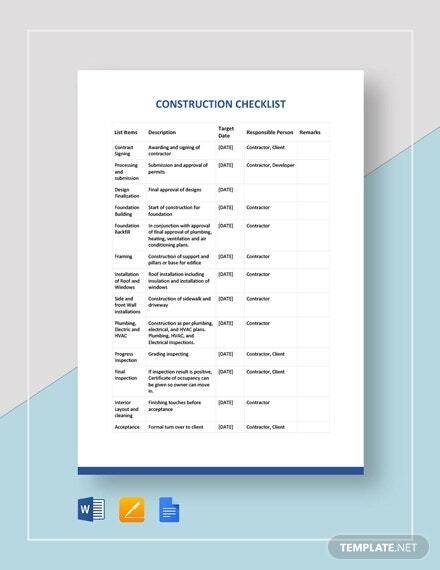 A construction checklist helps in terms of the planning of the things that are needed to be done on their scheduled time. It also gives more efficiency to the process of how a project is to be done. 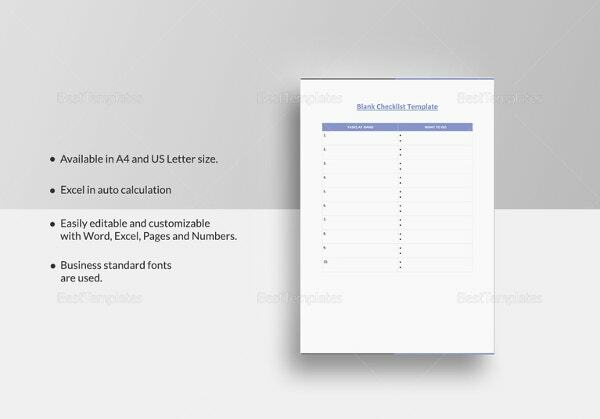 You may take a look at our Checklist Template and base your sample checklist layout from there. 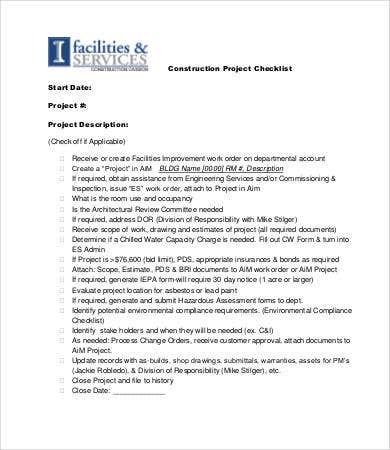 A construction checklist helps both the client and the construction firm or organization responsible for the construction. 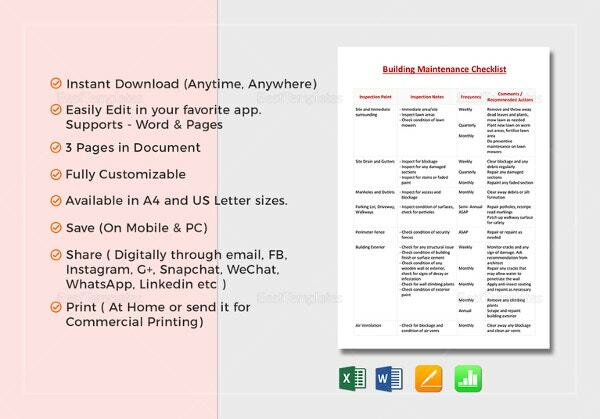 It ensures the clients that their builder is working efficiently and are doing their job the best way possible through accomplishing the checklists that is given. On the other note, the builders will be able to systematically plot the things that they need to do, how it is to be done, and when shall this things be implemented for action. 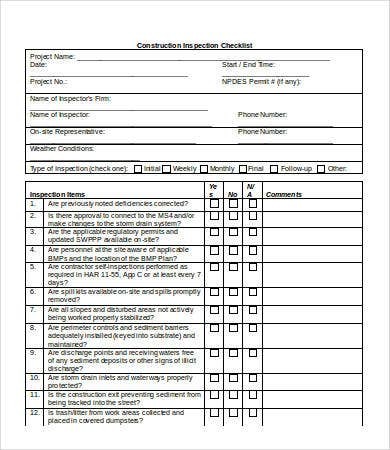 A construction checklist usually includes items that are needed for the building processes which include all the materials and products necessary for things to be done, the number of items that are needed per product, the amount of time that these products will be delivered, and the product specifications depending on the needs and requests of the client. 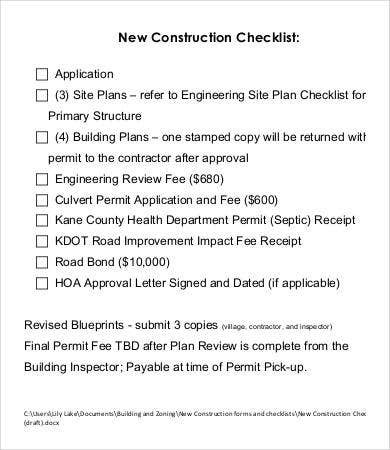 Also, most construction checklists are used for preconstruction. 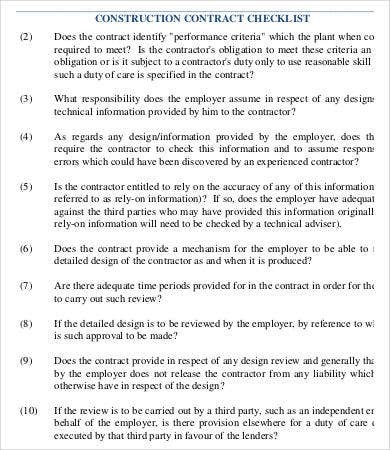 They are used so for the reason that the builders should know if everything that is needed for construction processes are already available on hand. 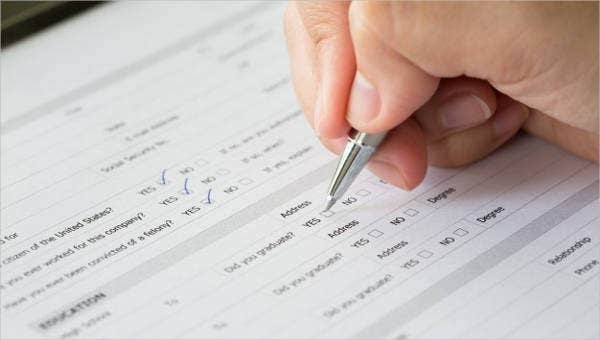 There are also factors that they need to check before construction which includes the weather, the people who will do specific tasks, the amount of time needed by each person to work properly on the construction site, and the terms and conditions on how a construction is to be done and finished. 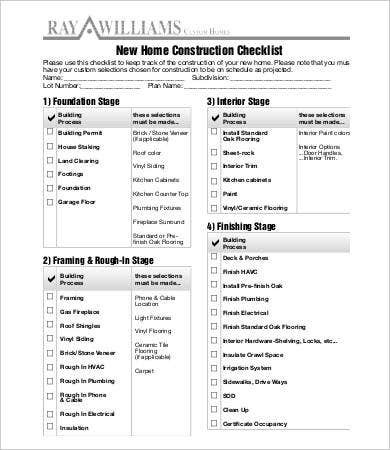 We have have downloadable templates of a Blank Checklist and a Word Checklist . 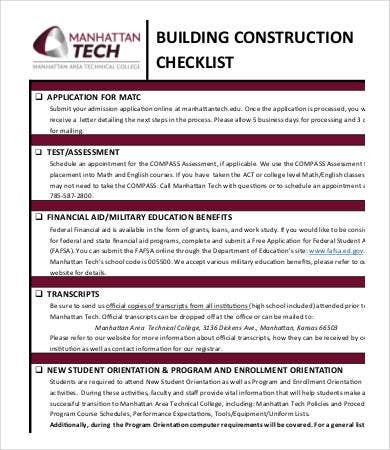 You may choose which one of them is applicable to be used as a checklist for the construction project that you will be doing. 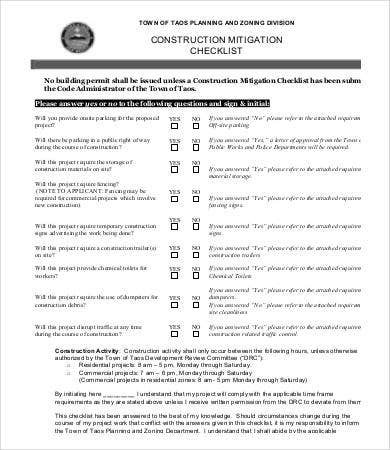 It is very important to have a construction checklist as it will allow everyone involved in the construction to know the details of every step that is being done for the construction purposes. 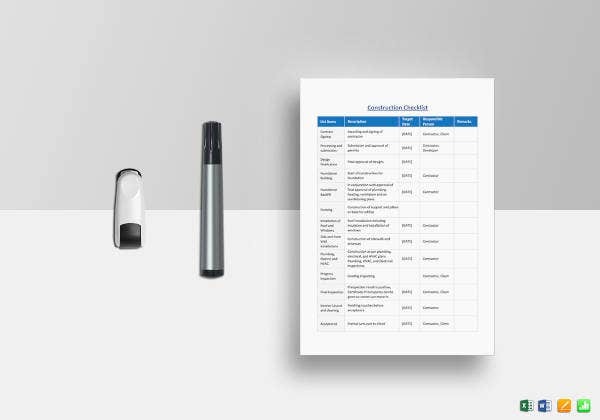 Also, it will help them to track whether specific tasks are done at the right time and if they are done properly and in the manner that will delight the client. 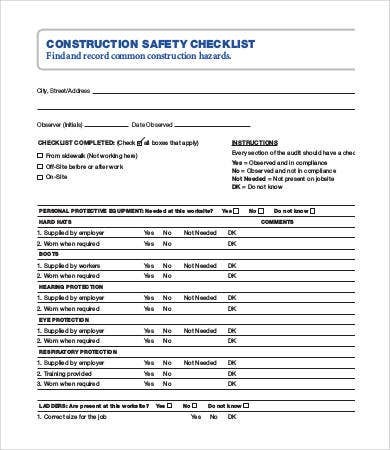 Having a construction checklist is also very important as it provides assurance of the safety of all the construction workers. There are safety measures that should always be looked at in all constructions may they be for big or small projects. It is always a priority to finish a project without anyone getting or hurt or inflicting damages both on people and properties. 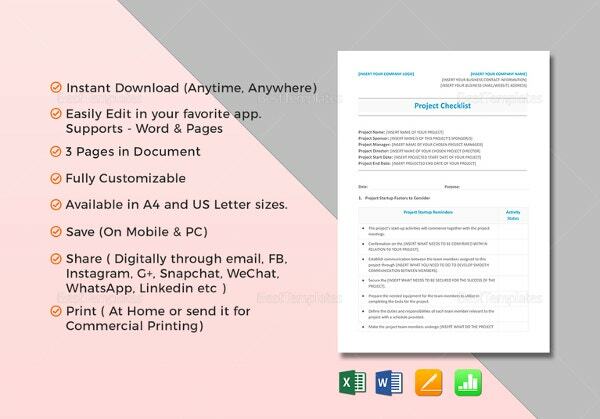 You may take a look at our Project Checklist for more samples of project completion listing templates.